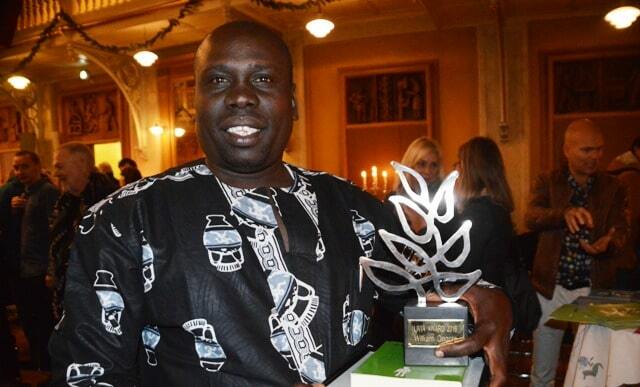 William Ongoro receiving the Livia Award 2016 in Copenhagen. Copenhagen. Nov. 2016. When William Ongoro, Coordinator of the National Platform for Peace and Reconciliation in South Sudan, enters the stage at the Livia Foundation’s bi-annual prize ceremony in Copenhagen, he invites the audience of about 200 people to stand up and hold each other’s hands. “This is a symbol that illustrates the strongest, the weakest and the disparity and dependability between South Sudan, Gaza, Aleppo and other war-torn places, where women, children and men suffer, and the Europeans and Danes that sympathize with us,” he says. The tone is struck. After such a beginning, no one is in doubt of what William Ongoro stands for. He has turned us, the audience, into a living sculpture of the Livia Foundation’s motto “Peace building is always a collective responsibility”. He has obliged us to comply with it. William Ongoro is 38 years old. He was born and raised in Juba, the capital of South Sudan. Most of his life, he has lived in war. He was five when the 2nd Sudanese Civil War broke out in 1983 between Northern and Southern Sudan. It lasted until a peace agreement was reached in 2005. South Sudan gained its independence in 2011. Two years later the new country was plunged into a brutal military conflict by warring political interests causing immense suffering among the civilian population (see box). Nevertheless, William Ongoro believes in peace. “Peace is fundamental for anything else. Nothing can grow without peace,” William Ongoro emphasizes during his acceptance speech for the Livia Award. The following day William Ongoro explains how he became a peace builder. It’s winter and temperatures are below freezing point. We are at the International Press Center’s premises in central Copenhagen. Even inside the building William Ongoro still wears the woolen scarf and winter jacket that he uses to protect himself against the cold outside. But the warmth and enthusiasm of his eyes and voice are not to be mistaken as he tells his story. Two years ago, in 2014, William Ongoro went to see his boss. At that time he was the head of Oxfam Ibis humanitarian work in South Sudan. He felt stuck in his job and felt as if he could not fully fulfill it. He holds a Master’s in Development Studies from University of Juba, but the theoretical concepts that had sounded so convincing in the classrooms, were hard to implement in real life. William was looking for advice from his boss on how to combine theory with practice in a meaningful way to increase the impact. “I am forever grateful for his reaction. He listened carefully to me. Then he said he would think about what we could do,” William Ongoro explains. A few weeks later, he encouraged William Ongoro to apply for a capacity building short course in Conflict Transformation and Conflict Sensitive Programming offered by Danida Fellowship Centre (DFC). The course became the needed game changer for William Ongoro. First, he attended a two-week workshop in Uganda together with participants from a dozen other countries. Later, he travelled to Denmark for a week-long course. William Ongoro explains that the learning methodologies used during the course were highly interactive both regarding the analytical and skills oriented parts. The trainers used case studies, role-plays, reflective exercises and made great use of the participants’ practical experience. “I realized that many of the problems communities face in South Sudan are similar to the ones in Sierra Leone, Kenya, Burundi and Ghana. The Europeans have their wrangles and difficulties sorting them out. I learned that wherever you go, mutual dialogue is a key tool in conflict resolution,” he says. By the time the DFC course was ending, William Ongoro knew that he had to embark on a journey of reconciling conflicting communities in his war-torn home country. In 2015, he took up the position as coordinator of the National Platform for Peace and Reconciliation in South Sudan, an umbrella organisation of 74 civil society organisations. Looking back, he describes it as the most challenging job he has ever done. “Communities in South Sudan used to peacefully co-exist, but the conflict that began as a political dispute has taken an ethnic turn that has divided people. It has created mistrust, anger and fear that are very hard to overcome,” he says. By 2015, the animosities along ethnic lines had reached a point where even neighbours, who used to be on good terms but belonged to different ethnic communities, no longer spoke to each other. They did not even offer condolences if a neighbour’s family member had been killed. The National Platform for Peace and Reconciliation began a program called “Know Your Neighbour Peace Campaign”. At first, they invited the chiefs from the different communities to dialogue meetings. In the beginning 30-40 people would attend. In some places, when the chiefs gained more trust, up to 400 people would join. During these meetings, the chiefs would get a chance to express their grief and tell their stories of how they had lost children or other family members due to the conflict. William Ongoro and his teams would make sure that the stories told were factually correct to avoid creating even more mistrust. They would also steer the sharing process in a way where both sides would realize that, regardless of ethnic affiliation, they were all victims of the bigger conflict. Hence the way forward was not revenge. Revenge would only intensify the conflicts. “We called the gatherings dialogue meetings, but they were really reconciliation meetings,”Williams Ongoro. He explains that, at a later stage, the chiefs were paired up in twos, each from different communities. Together they would visit their respective communities to spread the message of dialogue as a way towards peace and reconciliation at community level. “It has been a very challenging process and far from perfect, but I am humble to say that we prevented several communities, and even a camp for internally displaced people, from descending into further violent clashes,”William Ongoro elaborates. Based on the experiences of ‘Know Your Neighbour Peace Campaign’, he and his team are now developing an even greater program of peace building and mediation at community level to be initiated in 2017. “We are one people, one nation. We have to work together for peace from the bottom to the top. If we fail, I am afraid we will destroy ourselves completely,”he says. The award is given to William Ongoro for acting bravely and wisely in the painful and violent conflicts of South Sudan. For bringing the contending parties together for contact, dialogue and mediation, and for bridging the gap with great personal risks. We also acknowledge the well-thought and creative measures used by William Ongoro to raise public awareness of constructive conflict resolution and peacebuilding. We congratulate William Ongoro and his co-workers for having contributed to reconciling conflicting communities and uniting former enemies under very difficult circumstances. The Livia Foundation was brought into the world to make visible the courageous and non-violent approach to conflicts in societies, which are being practiced every day everywhere on this planet, but even so often overlooked by the media. William Ongoro took part in the DFC course, Conflict Transformation and Conflict Sensitive Programming, two weeks in Nov.-Dec. 2014 in Uganda and one week in Feb. – March 2015 in Denmark. From 2005-15 180 people from 22 countries have participated in the conflict transformation courses handled by MIRO Global Consult and ideThandling for DFC. According to the Security Council Report of December 2016, there are now 1.73 million internally displaced people in South Sudan. 1.05 million have fled to neighboring countries since the start of the conflict three years ago.